At its most fundamental level, the f-number tells us how much light is reaching the sensor. To be a little more precise, this quantity of light is the intensity per unit area. This will be discussed in greater detail later, but for now, some more basics. For example, an f/4 lens has a diameter ¼ of its focal length. Therefore, if the lens has a focal length of 100mm, the diameter of the entrance pupil will be 100mm/4 = 25mm. This also explains why long telephoto lenses are so large, especially if they have a large aperture such as f/2.8. So far, I have been referring to this value as the f-number since that is the most intuitive. Nevertheless, you will almost always see the f-number called the f-stop. These two definitions have the same meaning, and are a numerical representation of the aperture. The origin of the term f-stop goes back to the days when camera lenses had a ring on the lens barrel to set the aperture, shown in Figure 2. This ring would mechanically stop at each predefined f-number, consequently the f-numbers printed on the rings were commonly called stops. This terminology lives on to this day, so from now on I will generally refer to the f-number as an f-stop. A few modern camera lenses do have a ring on the lens barrel to adjust the aperture, although the ring generally functions as an electronic control rather than having any mechanical linkage. These are what are referred to as whole stop increments because when you move from one stop to the next, for example from 1 to 1.4, the lens is letting in exactly ½ the amount of light. It would be well for you to memorize this sequence as it will help you get a feel for how much light your sensor is receiving. Notice that the numbers above are not listed as fractions, i.e. f/1, f/1.4, etc., even though that would be more accurate. F-stops will often be represented as such for the sake of simplicity, and is generally how they are printed on an aperture ring (Figure 2). I want to address the subject of large versus small f-stops. As you may have noticed, the larger the number representing the f-stop, the smaller the entrance pupil. 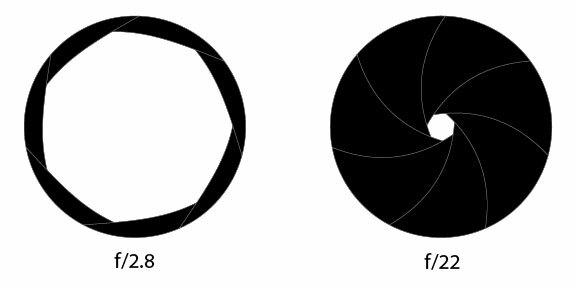 In other words, f/4 has a larger entrance pupil (smaller aperture) than f/16. Therefore, we would say that f/4 is larger than f/16. This concept can be a bit counterintuitive at first, but remember that this is a consequence of the f-stop being a ratio. Unfortunately, there is no hard and fast rule for the above definition. The confusion arises from how we say the aperture. We say the aperture is “f-number.” For example, we would call an aperture of f/4, “eff four,” not “eff over four.” Because of this, some will insist that a large f-stop would imply a small aperture. For example, they will tell you that f/16 is larger than f/4. Of course, anybody with basic math skills will see the problem with this definition, but it does exist. In publications, you may see it referred to either way depending on the author. Confusing for a beginner? Yes, it is. Deal with it. My advice, use the first definition as it is the most popular. Let’s look at how the aperture works in a real camera lens. Figure 3 shows a simple prime (single focal length) lens. The entrance pupil at the front of the lens is called the aperture. This is what determines how much light passes through the lens and reaches the focal plane. Notice that while the front lens element is fixed, the effective size of the entrance pupil (the aperture) can be varied. This is done by a mechanism called the iris, generally referred to as the aperture blades, as can be seen in Figure 3. Note the iris opening at different apertures in Figure 4. As the iris closes, the effective size of the entrance pupil shrinks, permitting less light to pass through the lens. 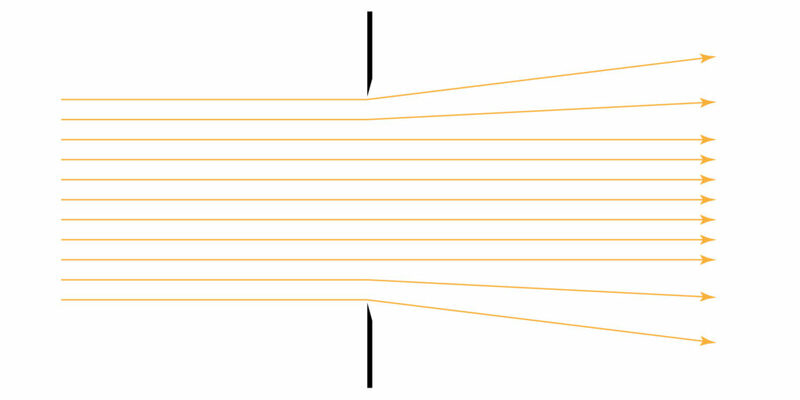 A visual representation of the different size iris opening at different apertures. The quantity of light that the aperture allows to pass through the lens is measured by the intensity of the light per unit area at the sensor. To help visualize this, let’s say that you point a camera at a uniformly illuminated surface and measure the number of photons reaching the sensor. Now let’s imagine that you partition the sensor into equal squares of pre-determined size. Each square will receive the same number of photons. Keep this concept tucked away in your head. This means that you can take the same lens and mount it onto different cameras with different sensor formats, and the aperture will remain unchanged. 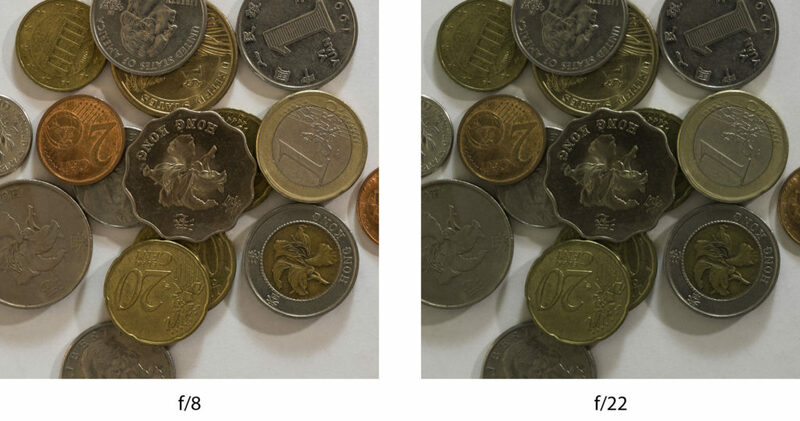 Of course, a smaller sensor will mean that some of the image has been cropped off, and consequently will receive less total quantity of light, but the exposure will be the same in both images. As a practical example, consider an image taken on both full-frame and APS-C cameras. A full-frame sensor is 2.25 times larger than an APS-C sensor. Therefore, it will also collect 2.25 times more light when using the same lens, but the intensity per unit area will be the same because the light is spread out over an area 2.25 times larger. For more information about this subject, I will recommend you to my article on equivalence. 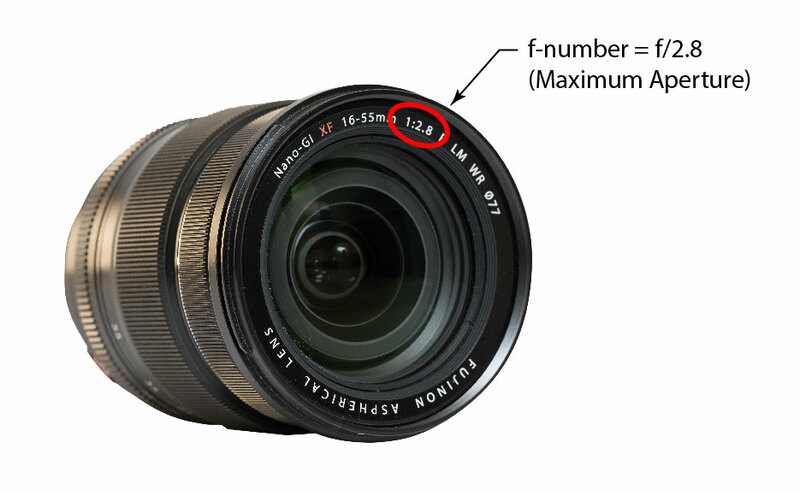 I mentioned above that you will always see the f-number printed on the lens barrel (Figure 1). This number can be written as either f/number or 1:number, just remember that it means the same thing. 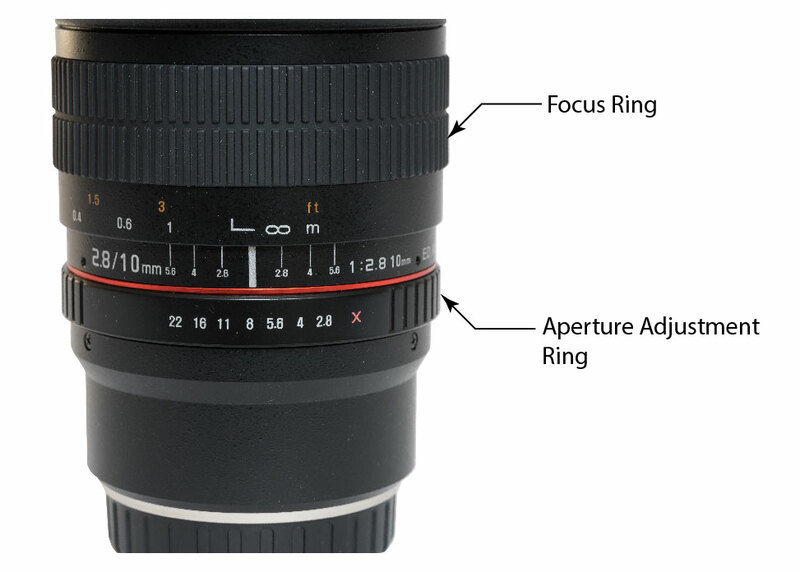 Many zoom lenses, especially lower end zoom lenses, will have a range of apertures listed, such as 1:3.5-4.8 for the lens shown in Figure 5. I will tackle zoom lenses later, but for now I want to stick with a simple prime lens. This number represents the maximum diameter of the entrance pupil the lens is capable of. It is important to note that this is how lenses are referred to. Therefore, a lens with a maximum of f/2.8 would be referred to as a 2.8 lens. Since 2.8 represents a fairly large entrance pupil, this is called a fast lens. A slow lens would have a maximum of, say, f/5.6. Initially, it might not make too much sense to think of a lens as being either fast or slow. However, it makes perfect sense once you realize that a fast lens lets a greater amount of light pass through to the sensor, allowing you to use a faster shutter speed. I may refer you to my article on the exposure triangle for a detailed explanation of the relationship between ISO, shutter speed, and f-stop. For the explanation in this article, let’s assume that the ISO (the sensor’s sensitivity to light) is constant. We can see that the two parameters that affect how much light reaches the sensor are the shutter speed and the f-stop. Therefore, these two parameters are complementary. If we double the shutter speed, we must open the aperture one stop. For example, let’s say that we have a correctly exposed image at 1/30 second and f/5.6, but realize that 1/30 of a second will not be fast enough to freeze the action. We could select 1/60 second and f/4, or even 1/120 second and f/2.8, and the exposures between all three images would be identical. Zoom lenses are a lot more complicated than single focal length lenses. Remember how I mentioned that many zoom lenses have an aperture that varies throughout their zoom range, as seen in Figure 5? This is because the aperture is a numerical result obtained by dividing the focal length by the diameter of the entrance pupil. As can be seen in Figure 3, the size of the front lens element is fixed. So, if the focal length increases, the aperture must get smaller, even if the iris blades do not change size. There is simply no way around this phenomenon. Or is there? Some high-end zoom lenses, such as the Canon 70-200mm f/2.8 L, have a constant f/2.8 maximum and f/22 minimum throughout the entire zoom range. However, this is due to the manufacturer correspondingly reducing the iris at focal lengths below 200mm to maintain the same aperture. In fact, they will do this for all f-stops at all focal lengths throughout the entire zoom range. By doing so, they keep the aperture the same regardless of the focal length. If you do the math, you can see that given a maximum aperture of f/2.8 at 200mm, the maximum aperture at 70mm should be f/0.98, or about f/1. 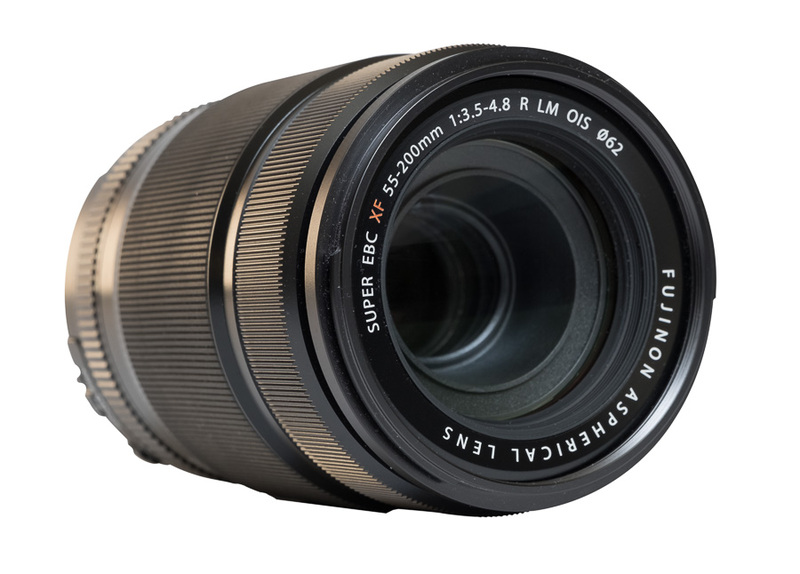 So, the question is, could this lens be a 1:1-2.8 rather than a constant 1:2.8, thereby providing a faster lens at the shorter focal lengths? The simple answer is, yes it could. In reality, things are a lot more complicated. One of the main benefits of having a constant aperture throughout the entire zoom range is that it can be simpler to operate since the photographer does not have to worry about the aperture changing while zooming. For landscape photographers, this may not be a big deal. For anyone shooting moving subjects, this can be huge. Lens sharpness is another big reason why the manufacturer would limit the maximum aperture. 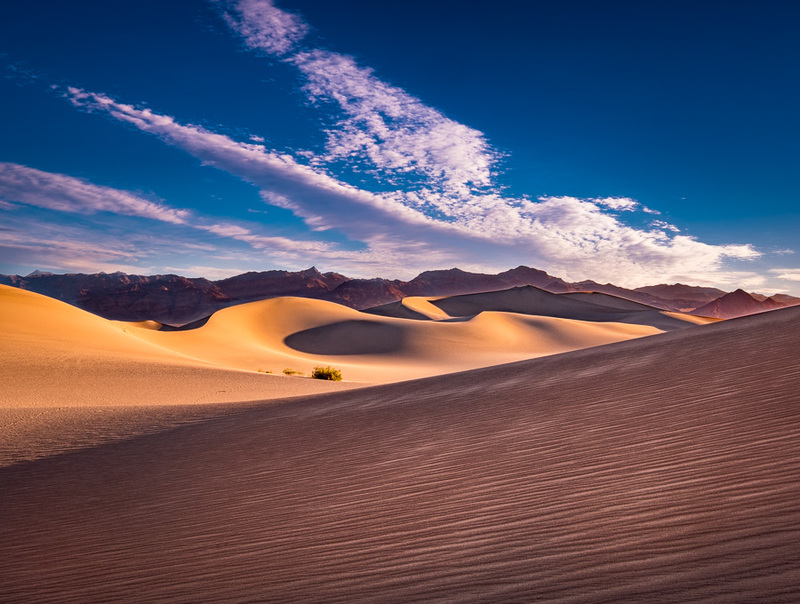 While this article is not intended to explain lens sharpness and distortion, it needs to be mentioned that most lenses will be sharper when stopped down a couple of stops past their maximum aperture. For most lenses, this will occur at around f/5.6 to f/8. It is very difficult and costly to manufacture a lens that is sharp at very wide apertures. Using the very popular 70-200mm f/2.8 as an example, making the optics usable at f/1 would put the lens out of reach for the average consumer. The following is a bit more technical, so if you want to skip this section feel free to do so. However, for the sake of completeness, I am including it. I want to explain in further detail how various lenses with different focal lengths, set to the same f-stop, will provide identical exposures. Remember that the f-stop is the focal length divided by the entrance pupil. Therefore, if the focal length increases while the f-stop remains the same, the entrance pupil must be increased. In turn, it seems natural to assume that more light would pass through the lens. As it turns out, that is precisely what is happening, with a simple caveat that I will touch on later. For now, let’s look at some numbers. Which means that 4x more light is transmitted through the 100mm lens than the 50mm lens. You might be led to believe that the 100mm lens would cast an image 4x brighter than the 50mm lens. However, the image has been magnified 4x, effectively meaning the image would need to be projected onto a sensor 4x as large (2x in both vertical and horizontal dimensions). In reality, the sensor will be the same size in both cases, so you are only seeing 1/4th of the image compared to the 50mm lens*. Therefore, the images will have the same intensity, or the same number of photons per unit area. A practical real-world example would involve comparing the same images captured on a full-frame camera verses a Micro Four Thirds camera. The crop factor in this case is 2x. The difference in sensor area is 4x. A similar image could be obtained by using a 100mm f/8 lens on the full-frame and a 50mm f/8 lens on the Micro Four Thirds camera. As the math above shows, the exposure will be identical. This is because the 100mm lens lets in 4x as much light as the 50mm lens, but must cover an area 4x larger. Therefore, the intensity of the light is the same on both sensors. Note that neither the depth-of-field nor the total amount of light collected will be the same between the two (for an explanation, see my article on equivalence), but the field of view and overall exposure will be identical. *This is a bit overly simplistic. It turns out that the image circle cast by both lenses will be the same. A detailed explanation is beyond the scope of this article. What matters to our discussion is that the intensity of the light cast on the image sensor will be the same in both cases. Depth-of-field is the range in your image that appears sharp, from near to far (Figure 6). This article is not intended to be an in-depth study into the subject of depth-of-field. However, it is important to know that the f-stop you select will determine the range in your image from near to far that will appear sharp. Notice that about one third of the range of apparent sharpness is behind the focus point, while two thirds is in front of the focus point (Figure 6). If you remember nothing else from this section, it is this: the larger the f-stop, the less range of acceptable focus. This is demonstrated in Figure 7. Notice how much more of the image appears sharp at f/16 versus at f/2.8, even though the lens was focused on the front domino in both cases. It is true that using a smaller aperture will give you a greater range of acceptable sharpness in your image, but there is a bit of a gotcha. There are consequences to using too small of an aperture. You will encounter a phenomenon called lens diffraction, which makes your image softer. This phenomenon is due the wave nature of light bending when it encounters a sharp edge. In a camera lens, diffraction occurs due to light at the edges of the iris bending rather than passing through as a straight line, shown in Figure 8. This is demonstrated in Figure 9. Both images were taken with the same lens, but notice how much softer the image is at f/22. It clearly does not have the level of detail or sharpness as the image shot at f/8. Most lenses will have a sweet spot that provides maximum image forming capability. Remember from the above discussion that lenses tend to be sharper when stopped down rather than wide open. For most lenses, maximum sharpness is between one to two stops from wide open. For example, for an f/2.8 lens, the aperture that will give you the maximum sharpness will likely be about f/5.6. You must test this on your own lens, as no two lenses will be the same. I need to add that an image suffering from diffraction is better than a blurry, out-of-focus image. It is wise to choose your aperture correctly for the given application. If you can get away with a larger aperture with less diffraction, then by all means do so. However, if you need to select a smaller aperture to keep everything in focus, then don’t hesitate. Keep in mind that you must do what it takes to get a sharp image. While most of the light entering the lens will pass through to the sensor, some will be lost. This light is either reflected off the front of, or absorbed by, the glass lens elements. Unfortunately, there is no way of avoiding this. It can be reduced using exotic materials and coatings, and this is part of what you are paying for in an expensive lens. However, it is impossible to eliminate it completely. As a rule, the more complex the lens, the more light that is lost. This is especially true for zoom lenses, which tend to be extremely complex. Unfortunately, the f-stop does not account for this light loss, and therefore is a measurement of the lens’ light transmission in a perfect world. This is where the t-stop comes in, where the “t” stands for transmission. The t-stop is the corrected f-stop accounting for the lens’ light loss. However, the t-stop is generally not marked on photographic lenses, so you will either have to test the lens yourself or look up your particular lens’ performance on a site like DxOMark. I have written an entire article explaining the t-stop in much more detail, but I wanted to give you a quick introduction to it. I must admit that this article ended up being much longer than I had originally intended. Sometimes we fail to understand how complicated something can be until we write it down. In fact, there is a tremendous amount of highly technical information that I had to leave out. I feel like I might have overwhelmed most people already. I know that I can get carried away with the technicalities. After all, I have two engineering degrees, in addition to degrees in math and physics. But my intention is not to scare anybody away, rather to leave you with a better understanding of how your camera works and the photographic process. Ultimately, what really matters for any of us is taking better pictures, and having fun in the process. I sincerely hope that this article is useful to you in that regard, but just remember not to get too stuck in the technicalities. Take things one step at a time, and remember that practice makes perfect. With time, you will master the techniques and it will become second nature. This will allow you to focus on what matters most, which is capturing the best image possible.